As I sit here preparing for the 12th time I have written this article, I am still awestruck at what I just witnessed on Monday Night Football. The Rams and Chiefs may have just put on the best game I have ever seen. I can’t believe I just saw a game total over 100 points and I sure hope that if you bet, you bet the over. Now as we look forward to week 12, we are going to be missing some heavy hitters on the main slate yet again. The Rams and Chiefs are the only teams on bye this week. However, thank goodness, it is finally Thanksgiving week. I get to shove my face full with amazing food and watch some football all at the same time. 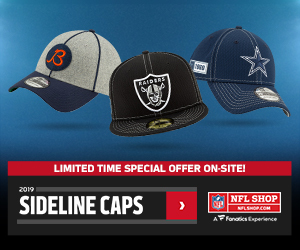 Those Thanksgiving day games are not available on the main slate and those teams are the Bears, Lions, Cowboys, Redskins, Falcons, and Saints. Sunday night has the Vikings and Packers, while Monday is the Titans and Texans. That is 12 teams that are unavailable to the main slate in week 12. That is why I am here though. 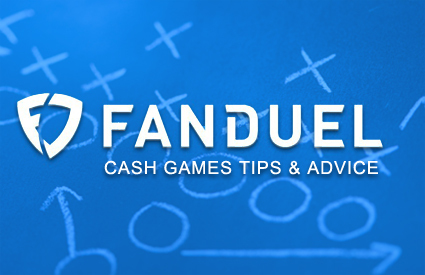 Here are my 7 players to consider in FanDuel cash games for week 12. For everyone that had questions about Luck’s health earlier in the season, he has proven to be completely healthy. 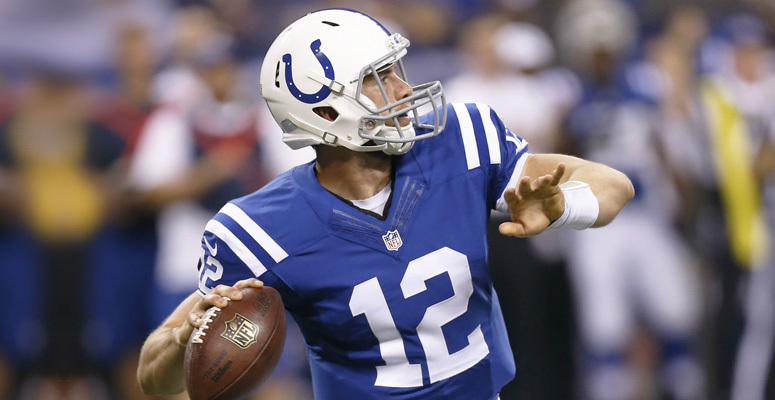 Andrew Luck has 3 or 4 touchdown passes in his last 7 games. He is also averaging 23.05 FanDuel fantasy points per game over his last 4 starts. Since the emergence of Marlon Mack, Luck’s attempts have fallen but his efficiency has improved. In week 12 he faces a Dolphins defense that has allowed 2.25 passing touchdowns per game over their last 4 games. The same defense has allowed 31 or more points in 3 of their last 4 games while the Colts offense is averaging 36.5 points per game during the same 4 game stretch. Luck should produce at the same level in week 12 that he has this entire season. My selection of Baker Mayfield as an option at quarterback is for multiple reasons. For starters, he is on the cheaper side of all of the options at the position. Add in that the Bengals have been the worst team against quarterbacks over the last 4 weeks and Mayfield is already an interesting option. The Bengals defense is bad, and Mayfield has been improving. In his last start, Mayfield threw for 216 yards and 3 touchdowns on just 20 pass attempts. He also threw only 3 incompletions in the game. The Browns are coming off their bye which should have given them plenty of time to gameplan around Mayfield’s strengths. If 12 weeks of football has told us anything, its that you must start players against the Bucs defense. This week that start has to be Matt Breida. He is a solid and cheaper option as well as being the best offensive weapon that the 49ers have. Breida will receive the majority of the carries in this matchup and should also get work as a pass catcher. According to Daily Roto, the Bucs defense has allowed the 6th most points to running backs since week 8. Over the same time frame, the Bucs, on average, are allowing 110 rushing yards and 1.5 touchdowns per game. Breida is in a position to pay off his price tag and then some. Saquon Barkley has been almost as dominant as Todd Gurley this season and I expect the dominance to continue in week 12. Barkley sees the Eagles for the second time this week. Their first meeting resulted in Barkley rushing for 130 yards, a touchdown, and 9 catches for 99 yards. He is still the focal point of the offense and that is not going to change. Barkley has received 20 or more touches in his last 5 games and 8 of 10 games this season. As for the Eagles, over the last 4 weeks, they have allowed the 7th most points to running backs. Broken down to the last 2 weeks and the Eagles are the 2nd worst against the position. 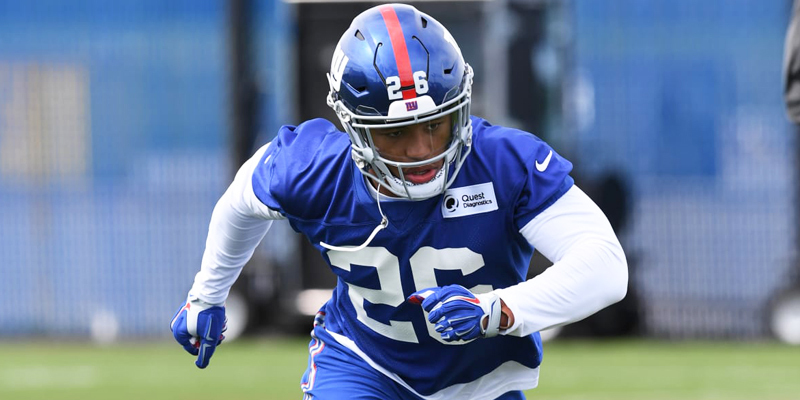 Barkley will be the focus of the Giants offense and with the Eagles defense on the ropes, he is primed for another great week. I’ll keep the trend this week going with a cheap option for the week first. DJ Moore is that guy this week. I will admit that I am a huge fan of Moore and what he is capable of. Moore is a great talent and has flashed it recently. If the Panthers are smart, they will continue to make Moore the focal point of the passing game. Moore is fresh off a 7 catch and 157-yard performance and now faces a Seahawks defense that has struggled against opposing receivers. The Seahawks are allowing the 2nd most points to receivers over the last 4 weeks. I believe that Cam Newton and Norv Turner are smart enough to realize Moore is vastly better than Devin Funchess and will start using Moore as the team’s number 1 down the stretch. 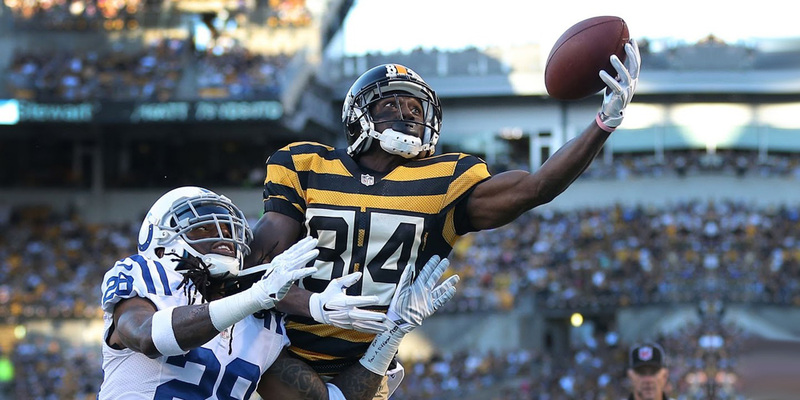 Do I really need to write a paragraph here as to why Antonio Brown is a good option this week? He has a touchdown in every game but 1 this season. He has at least 5 catches in every game this season. His worst game this season resulted in 11.2 points and that was week 2. He is Antonio Brown. That should be all you need to want to get him into your lineup. However, if you need more reasons, here are a couple. The Broncos are allowing 25.07 points per game to receivers over the last 4 weeks. 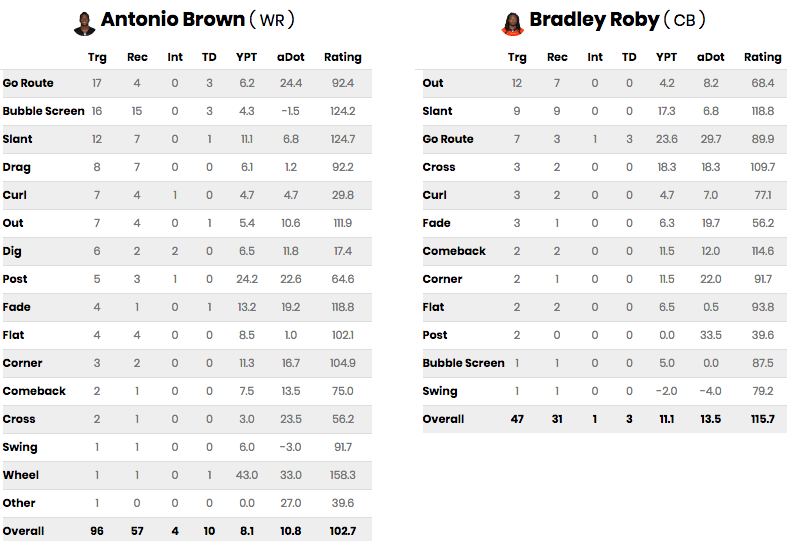 Brown will also be defended mostly by Bradley Roby, which means he will avoid Chris Harris. Roby has not been very good this season allowing a QB rating of 115.7 when thrown at. Brown is primed to explode. Jared Cook is still the best pass catcher among the Raiders weapons and gets a Ravens defense that is giving up the 9th most points to the position. Cook caught a touchdown pass in week 11 on the first pass of the game from Derek Carr. He saw 5 more targets after that and remained a contributor at a lackluster position. Cook will be an integral part of the passing game in week 12 as the Ravens should be able to pressure Carr all game and force him to get rid of the ball quickly. Without spending up on Ertz or Kittle, I think Cook has the best shot at producing this week. 6 weeks of regular season football left means 6 more weeks of cashing in. Good luck in week 12!